The ProDesk3D by BotObjects has been one of the most controversial 3D printer products over the past few years. Built by a small firm in London and purported to print in full color – albeit only in bands of mixed color that appear in gradations along the length of the printed objects – pre-orders sold out quickly and customers waited… and waited. While I don’t have shipping details – the founders Martin Warner and Mike Duma told me they are beginning to send machines to customers and are building in the U.S. and the UK – I can say I’ve finally seen how the machine works and it appears to be ready to go. The machine is quite large. It’s about two feet tall and is made of an aluminum base and coated metal body. There are a few external air intakes and three internal fans to cool the extruded plastic. 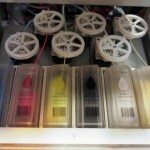 It uses multiple PLA cartridges – cyan, magenta, yellow, black, and white – as well as a main PVA support material that is a water-soluble plastic. The cartridges contain about 45 meters of filament. The print head is quite unique. The five filaments are pushed into the head and a small mixing head turns to meld the various plastics as the printer changes color. The company has a unique bit of software that allows you to add various gradients to objects and they are currently working on a way to add color data to standard STL object files. The “secret sauce” is in this small mixer and in the 13 motors that pull the plastic from the cartridges. Experienced 3D printers will be able to imagine the nightmare that will come with threading the filament through the machine and feeds but the team has said it’s been working fine in their tests. The build plate is unheated glass and it prints quite fast – 175mm/s – and is very quiet thanks to the specialized fans and the heavy construction. In the video below they were printing at 50 microns at maximum speed. “We wanted to be professional grade and we wanted to offer the maximum build capacity,” said Warner. On the design front, at least, Warner is right. The ProDesk3D looks as good as the Form One or the Replicator in terms of structural design and finish. The version I saw was as close to completion as possible but the final products will include an LCD readout on the front rather than a dot-array LED solution. This is obviously still a demonstration and not a complete test but, from what I can see, they have a real, working product. It’s not quite a full-color printer yet, although there are plans to allow a more fine-grained extrusion. I think the extrusion and mixing chain is far more interesting than the printer itself at this point and the potential for real full color desktop printing is on the horizon. In short, you won’t be able to print a color Sad Keanu – yet. Look for more updates as the team starts shipping and we get our hands on a unit. Posted in BotObjects. Bookmark the permalink.